Differently named sandwiches. Check out Naomi’s Funeral Sandwiches. Naomi has an addiction to Pinterest like I do. It has really sent her love of cooking into overdrive with new recipes. These sandwiches are one of those. Naomi says, When I saw that my friend, Erin, had commented on how tasty these things were, I knew they were being made and right away. Can I just say…YUMMERS?!?! They were so different and so tasty, it wasn’t funny! I loved the combination of the Swiss cheese and ham with the sticky sauce on top. Now, be sure to take the time to “marinade” these. The longer they can marinade the more tasty they are. I partnered with chips and corn on the cob for a nice light dinner that I will be making frequently in the Summer. When you serve these, you might want to have wet naps around. 1. Cut the rolls in half and line the bottom of a baking pan with the bottoms of the rolls. 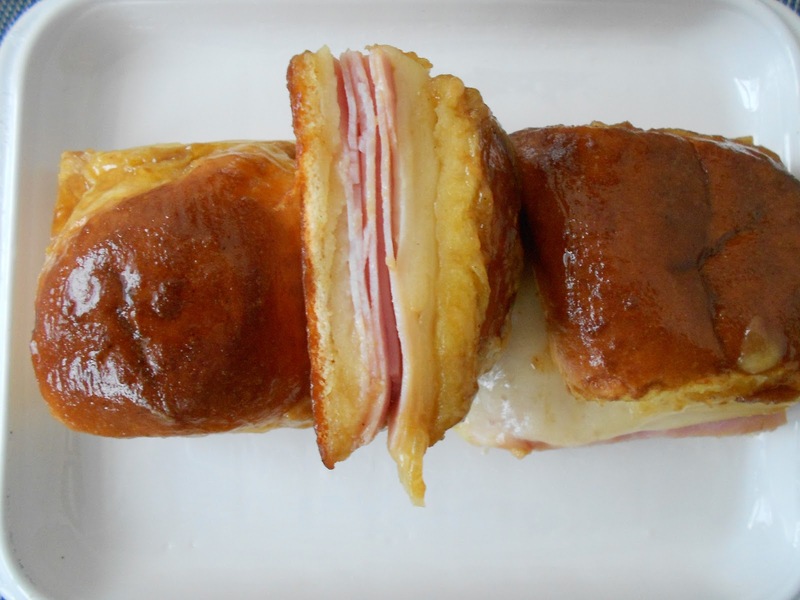 Layer the ham , then cheese and return the top half of the rolls on top of the cheese. 2. Mix together the butter, Worcestershire, mustard, brown sugar and onion powder. Pour the whole works over the buns, drenching each one. Cover tightly with foil and marinade anywhere from 4-24 hours. 3. Preheat the oven to 350 degrees. Bake for 20 minutes,uncovered, or until cheese is melted and bun tops are a bit golden.